St Peter and St Leonard's Church in Horbury, Yorkshire. It was designed by eminent York architect John Carr in 1791-3. Horbury was his birthplace parish and he met cost of building the church - £8,000- by leaving a bequest. 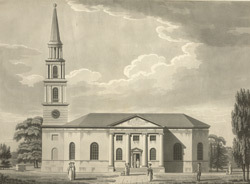 It is in the fashionable classical style with a porch of Ionic Columns, a pediment with a Latin inscription, an oblong nave and a well proportioned church tower.